Toast! It’s been a while since we talked toast and today, with it being 20 degrees out here in Ohio, I figured it would be good to chat simple food and some other random things that have been catching my attention. 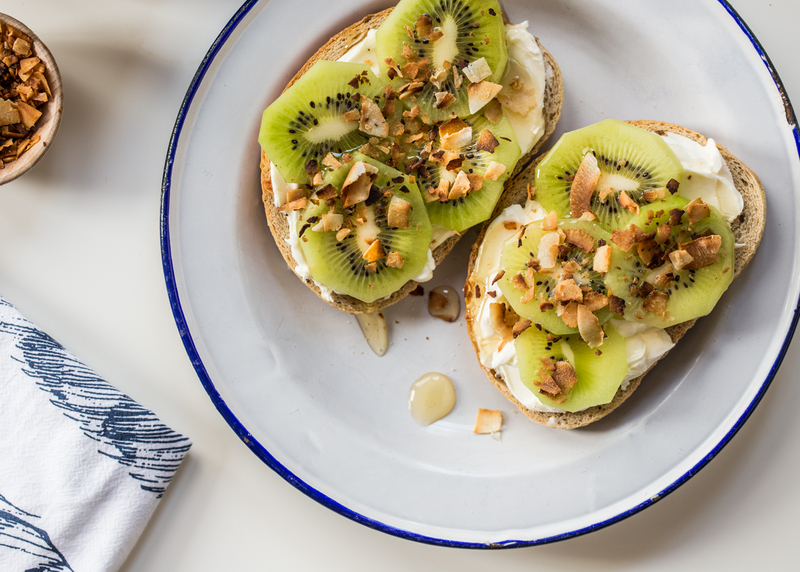 Let’s think of this discussing this Kiwi Cream Cheese Toast but also a collection of thoughts ala Thursday thoughts, but still on a Tuesday. I have been making several versions of this kiwi cream cheese toast the last several months and sharing it on Instagram. It has made me wonder why I had never thought to put kiwi on toast before? I love cream cheese on toast – or a toasted bagel – and have topped it with strawberries or apples or banana in the past. Well, I have been buying those packages of Mighties (I am a sucker for convenient packaging, what can I say?) like it’s my job and putting them on everything. The ended up on my toast one morning and voila, a new favorite was born. This time I added some toasted coconut for crunch and some honey for sweetness because sometime the kiwis can be a bit on the tart side. 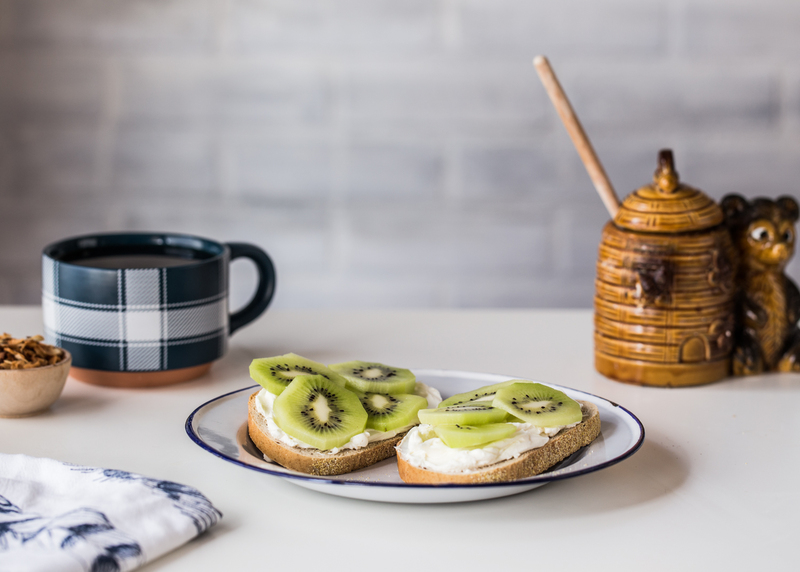 All in all, this is a SUPER simple and beautiful breakfast idea. Ok, I just had a Yo Gabba Gabba flashback circa 2009. Do you remember that show? Maybe it’s still on, I’m not totally sure. A was obsessed with that show when he was about 2 years old. For Halloween in 2009 he and C (she was a week old at the time) were DJ Lance and Foofa. I had a bought of super pregnant lady ambition and fashioned him a skinny orange suit complete with belt, hat, and boombox and he was just about the most hilarious looking thing ever. I also made C’s costume before she was born knowing we were expecting a little lady baby. That is still one of my favorite Halloween’s ever! Leave it to me to talk about Halloween in April. I never claimed to be a sensible person. In the last couple of months I have had a burst of creative ideas that don’t directly involve food but rather are tapping into my art background and it’s been SO much fun to explore. While some will be able to merge into what I do here on JT, others will be purely behind the scenes or in it’s own little corner of the world. For example: Handwriting. C’s Kindergarten class works extremely hard on their handwriting, as in handwriting homework every night – which is incredible! For me, handwriting has become such a chore. It’s as if my fingers have forgotten the art of the written word. I develop legit hand cramps after writing about 3 words on a paper. I wish I were joking. Amanda Arneill : I LOVE her Instagram as she will often pen the most wackadoo things that her kids say (which I totally relate to) plus she has an online class that I am eyeballing and seriously considering taking. Pieces Calligraphy: Sharisse from Pieces Calligraphy is a fantastic teacher! She has some wonderful YouTube videos breaking down how to begin with calligraphy and also discusses her favorite supplies. Her gentle voice is very encouraging and I feel like I have learned a lot with just watching a few of her videos so far. Plus, her IG is beautiful! Valerie McKeehan: Valerie recently wrote an entire book on chalk lettering called The Complete Book of Chalk Lettering that looks freaking amazing! If you are into chalk lettering, definitely take the time to seek her out. You are bound to be inspired! Ian Barnard : Ian does some incredible calligraphy, sometime with unexpected supplies like Crayola markers! His YouTube channel is fantastic for instruction videos and worksheets, too! So, while this was a rambling post, it feels good to chat with you! I hope you all had a beautiful and blessed Easter and I will see you back here on Friday for a fun and sunshine filled drink!! Spread cream cheese on toast. 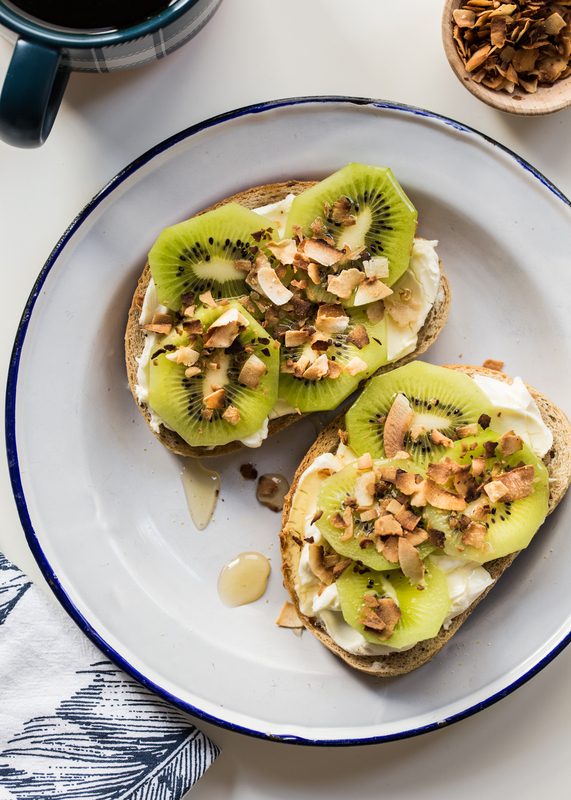 Top with kiwi slices, coconut flakes and drizzle with honey. Serve immediately and enjoy! 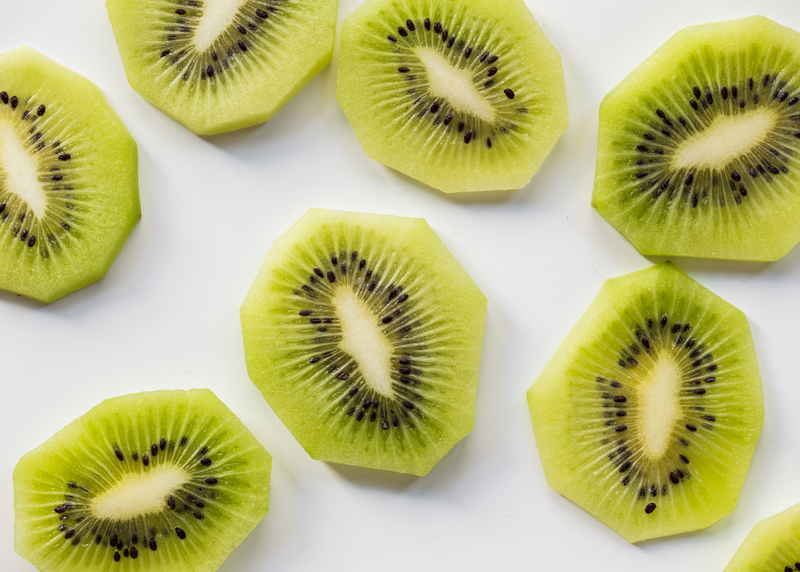 My two middles LOVE kiwi – thinking this would be a great new breakfast idea for them!